Odessa - legendary city of the former Soviet Union. City of romance, art, humor, poems, theaters and museums. Odessa is a very special city - city with its own very special culture. Odessa is situated in Eastern Europe, at the Black Sea coast. It is a very important port. Odessa itself is full of historical, architectural, cultural and scientific interest. Laughter, or to be more precise sharp-wittedness, is something of an everyday obsession in self-proclaimed humor capital Odessa. 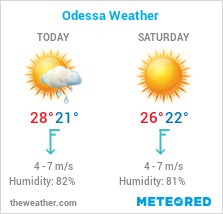 Odessa's mild climate, warm waters and sunlit beaches attract thousands of people year around. Its shady lanes, beautiful buildings and cozy squares impart to the city a certain air of intimacy. Odessa is simply enchanting with its marvelous architecture. The city proved itself fertile ground for various architectural styles. Some buildings display a carious mixture of different styles, and some are built in the Art Nouveau Style which was in vogue at the turn of the century or were done in Renaissance or Classicist styles which again returned to flavor early this century. The proximity of Odessa to the black sea allows easy access for tourists from the Mediterranean region, its International airport is a mere ten minutes away from the city center, assures the nightlife and the beaches are at a boiling point during the summer's peak months. Odessa is one of the few Ukrainian cities to boast regular international flights, and it is also an easy destination to reach by rail and road. Deribasovskaya. This famous street has been featured in a thousand of books, films and songs, and a trip to town cannot be complete without at least an hour spent strolling here or people watching from one of its many outdoor and indoor cafes. General population of Odessa is more than 1.2 million.